As mentioned in one of my previous blog posts, part of our mission in WP2 is the analysis of data availability policies of scholarly journals in Economics. Therefore we analysed almost 200 journals – regarding whether they own such a policy or not. If we found a policy we wanted to know what the aims of this policy are, how the policy is structured and what kind of material authors have to submit to comply with the policy. Of course it was even very interesting so see whether a policy is mandatory or not – as well as to examine who carries the responsibility to achieve that data and additional material are provided as mentioned within the data policy. For our sample who chose a mixed approach: On the one hand we used the sample, the German Economists Bräuninger, Haucap and Muck (paper is available German only, sorry) took for examining relevance and reputation of scholarly journals in Economics. This sample is primarily interesting because it compares international top journals and journals that are published in the German speaking area. Supplementary we added a few (four) more journals of which we explicitly knew that they own a data availability policy. Not only because we’re funded by the German Research Foundation (DFG) this is almost a perfect sample – the sample furthermore offers the possibility to get in contact with the editors of economic scholarly journals publishing in Germany, Austria or Switzerland. An important approach, because the editors are very important for addressing changes in the way academic publishing and especially publishing and linking data and publications takes place. So in total we had 154 journals in our primary sample. 13 of them were excluded for analysis, because these journals have a non empirical / non econometrical focus and were oriented on economic policies or theory only. Of course in some cases we were not really sure about a journal’s focus respectively whether we can be sure that this journal is not publishing any of the above mentioned articles. In these cases we did not exclude them from further analysis. I have to say that the sample doesn’t typify Economics in general – it’s higher ranked than average journals in Economics and by adding a few journals explicitly having a data policy the percentage of Journals owning a data policy also is higher than we might expect on average. In our sample of the remaining 141 journals the publishers Elsevier, Wiley-Blackwell and Springer dominated. I think this represents more or less the typical segmentation of economics scholarly journals. 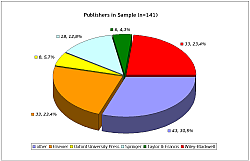 Journals published by professional associations or by university publishers comprise only a small amount within this sample. With 8 journals, Oxford University Press is the biggest of these publishers in our sample, followed by Cambridge University Press (3), University of Chicago Press (3) and the American Economic Association (3). 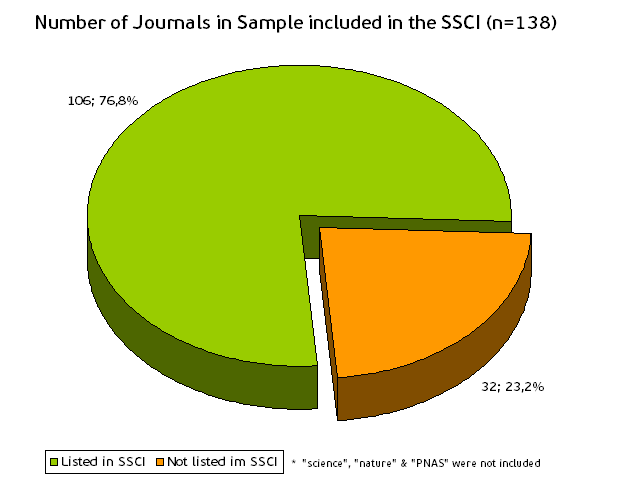 Regarding the form of publication the overwhelming majority of journals we investigated were traditional subscription journals. 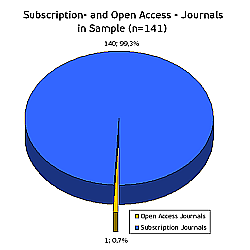 Only one of 141 journals was an OA-journal. With so few OA-journals in the analysis it wouldn’t be possible to state any well-founded results for these journals. Therefore we analysed another 54 OA-Journals in a special attempt. We did not merge this investigation with the other journals, because it wouldn’t be possible to check some of our hypothesis, if we had integrated these journals. So this is a special chapter and some kind of an excursus. 32 out of 138 journals (three were excluded, because they are cross disciplinary journals) were not listed in the SSCI (Thompson Reuters Social Sciences Citation Index) what representats 23,2%. So the remaining 76,8% are listed within the SSCI. This high percentage shows that our sample is manifestly higher ranked than average journals in Economics. On average the journals achieved rank number 118 (median: 110) what also underlines the statement above.